time or external factors, and stays the same year after year. one last transparent layer of enamel. Cloisonné: the designs or figures are drawn by arranging into shape pieces of fine gold wire, into which the enamel is applied. The liquid enamel is laid into the cavities using a brush. Next comes the firing, timed to the minute in a furnace at 800°C. After cooling, the excess enamel is removed by vigorous sanding using a hard stone and water. The dial is then manually polished with a diamond file, before a last firing called “Dorure” or gilding adds shine and reveals the enamel’s full splendour. This limited edition of the understated Girard-Perregaux 1966 collection is paying tribute to the untamed beauty of the magnificent Arabian ‘pur sang’ with its distinctive head shape and unmistakable elegance. Known as one of the oldest breeds in the world, the Arabian horse captivates the heart. Its eloquent head that has been artistically reproduced for hundreds of years is now featured on the dial in a vibrant hand-painted miniature. 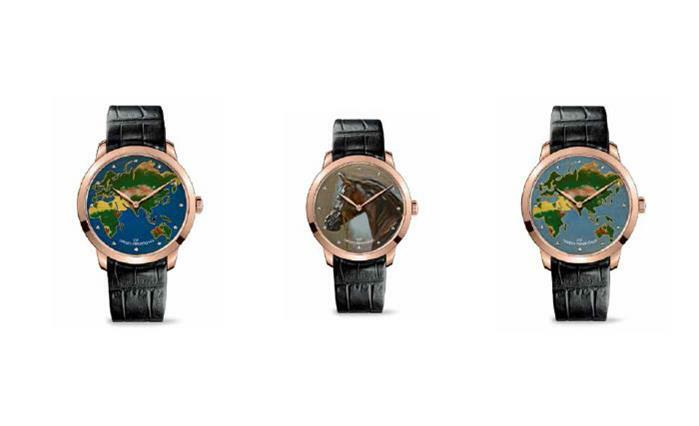 The vision of the dial of these two timepieces offers a vibrant example of Cloisonné enamel beautifully decorated with a map of the world, a great classic in the Haute Horlogerie tradition. Europe, Africa, the Americas, Asia and Australia are delicately outlined by tiny wires of gold precisely delimiting their contours and enamels hues. An invitation to voyage revealing new horizons of dreams. These Girard-Perregaux 1966 limited editions are housed in the elegant Girard-Perregaux 1966 round case and beat in time to the fine GP03300 calibre. The diversity and richness of the decorations and finishes adorning the multiple components of the movement can be seen through a transparent sapphire case-back.